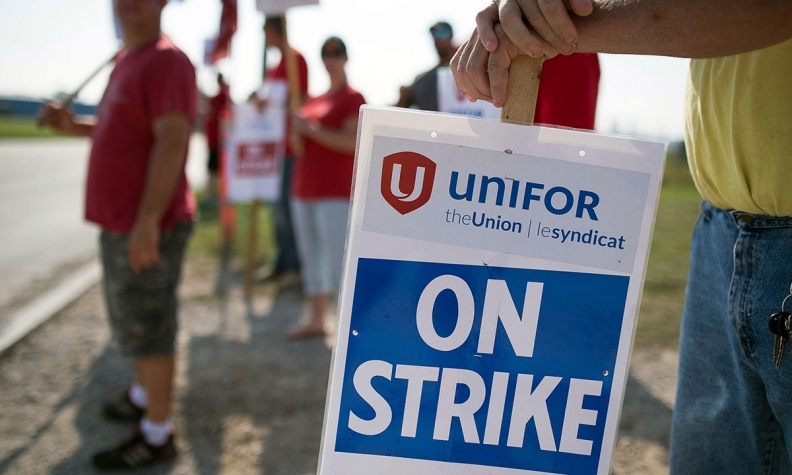 Employees and Unifor members picket outside the General Motors plant in Ingersoll, Ont. General Motors auto workers went on strike at a Canadian plant for the first time in 21 years, over jobs lost to Mexico, with the union's president calling the situation "the poster child for whats wrong with NAFTA." TORONTO -- It's 28 C and striking workers at a General Motors plant in Ingersoll, Ont., cluster around a barrel of burning wood. The fire is a nod to labour tradition, despite the September heat, as the union digs in for the first strike at a Canadian auto assembly plant since 1996. "We know we're in for a fight," Gordie Todd, a 27-year veteran of the plant, which makes the top-selling Equinox, said last week. "The last three or four contracts we've accepted what the company's brought to us just to keep the company going, and now it's our turn to take a little bit of that pie back." A lot has changed for Canada's autoworkers since 1996. The North American Free Trade Agreement was implemented in 1994, bringing low-cost competitor Mexico into the flow of tariff-free auto trade on the continent. Canada lost more than 53,000 automotive jobs from 2001 to 2014 before employment rebounded slightly, according to the Automotive Policy Research Centre at McMaster University. The workers say the timing is right to take a stand. As negotiators meet in Ottawa to continue renegotiating NAFTA, U.S. President Donald Trump has vowed to "make America great again" by bringing manufacturing jobs back to the United States. Canadian Prime Minister Justin Trudeau wants to improve labour protections under the pact and he's got a determined new ally in the talks: Jerry Dias, the president of autoworkers union Unifor. Dias shot into the spotlight at the last round of talks by pushing to bring Mexican wages in line with their U.S. and Canadian counterparts. "Right now we're renegotiating NAFTA and this is big news, this is international news that we've closed down this General Motors plant," said Todd Sleeper. He's worked at the factory, known as CAMI, for four years since being laid off from a nearby Caterpillar Inc. plant. That plant was closed after workers refused to accept a 50 per cent pay cut and some of the production was later moved to Mexico. "We need to start protecting jobs here in Canada." One of the main reasons for Canada's loss of auto assembly jobs is familiar to anyone who reads Trump tweets: Mexico. With its significantly lower wages, aggressive incentives, free trade agreements with other countries, lower manufacturing costs and a growing skilled workforce, the country has beat out Canada and the United States to win at least eight of nine North American vehicle assembly plants announced between 2011 and 2016, according to the Center for Automotive Research. Although CAMI has been producing flat out on three shifts a day, six days a week for eight years, it's also felt the direct impact of Mexico's automotive ascendancy. In January, GM shifted production of the GMC Terrain to Mexico from CAMI, costing the plant about 400 jobs. The move left CAMI with one vehicle, the Equinox crossover. GM recently spent $800 million retooling the plant for the 2019 model, an indication it has a healthy future though it also began producing the crossover at two factories in Mexico. This is the main issue that led to the strike: workers want CAMI to be designated the lead producer of the Equinox, which would mean any downsizing would have to happen in Mexico first. "Let's put it this way: If the economy tanks and they have to take production out of the system, where are they going to take production out of? The country that's making $5 all-in, or Canada where we're significantly higher? Our members could go back to $0 an hour and we still couldn't compete with Mexico," said Dan Borthwick, president of Unifor Local 88, which represents the 2,500 hourly workers at CAMI. It's a problem facing all Canadian autoworkers. Unifor's Dias called CAMI "the poster child for what's wrong with NAFTA." The plant is one of the most productive GM has, yet its jobs are still threatened, he said. Tony Faria, co-director of the University of Windsor's Office of Automotive and Vehicle Research, said GM is understandably reluctant to "take an oath in blood" that CAMI will remain the lead producer for the Equinox but it's still very dependent on the plant which turns out about 750 vehicles a day. "GM is going to start feeling the pain in a week to 10 days," he said. "There's going to be a lot of pressure on them." GM Canada President Steve Carlisle declined to comment on the strike except to call it "disappointing" and express his hope that negotiators can get back to the table soon. On NAFTA, Carlisle said the agreement should take into account the "competitiveness of the region" as a whole. "Asia has a whole range from high-cost regions to low-cost regions and Europe has a range of high-cost regions to low-cost regions, and that helps make them competitive from a global perspective," he said following a panel discussion last week at the Canadian Club of Toronto. "We have that same situation in NAFTA, so if we intervene in that in the wrong way, we'll deteriorate our competitiveness." But CAMI workers are determined that something needs to change. "We hope the representatives at NAFTA can understand that it's not an equal fight right now," said CAMI worker Todd. "We have to open their eyes to that. We can't lose everything to Mexico." Unifor met with GM on Sunday and presented a "comprehensive" labour proposal to the company in an attempt to end the week-long strike. The talks appear to be the first time the two sides have formally negotiated since the strike began. "Right now we're renegotiating NAFTA and this is big news, this is international news that we've closed down this General Motors plant," said Todd Sleeper. He's worked at the factory, known as CAMI, for four years since being laid off from a nearby Caterpillar Inc. plant. That plant was closed after workers refused to accept a 50 percent pay cut and some of the production was later moved to Mexico. "We need to start protecting jobs here in Canada." One of the main reasons for Canada's loss of auto assembly jobs is familiar to anyone who reads Trump tweets: Mexico. With its significantly lower wages, aggressive incentives, free trade agreements with other countries, lower manufacturing costs and a growing skilled workforce, the country has beat out Canada and the U.S. to win at least eight of nine North American vehicle assembly plants announced between 2011 and 2016, according to the Center for Automotive Research. The move left CAMI with one vehicle, the Equinox crossover. GM recently spent C$800 million ($649 million) retooling the plant for the 2019 model, an indication it has a healthy future though it also began producing the crossover at two factories in Mexico. This is the main issue that led to the strike: workers want CAMI to be designated the lead producer of the Equinox, which would mean any downsizing would have to happen in Mexico first. Unifor met with GM on Sunday and presented a "comprehensive" labor proposal to the company in an attempt to end the week-long strike. The talks appear to be the first time the two sides have formally negotiated since the strike began.